There was an exquisite drawing (not the one above) in the Royal Academy summer show that I found fascinating and beautiful, by Hiroe Saeki. I can't remember the actual drawing but I remember that it was highly detailed, with clean execution and a lot of pristine white paper around it, which is a feat in itself as anyone knows who does a lot of pencil drawing. Looking her up further, she's a Japanese artist who makes her drawings from imagination and nature. They have a meditative quality, sometimes whimsical. I wouldn't mind having one on my wall, one could get lost in it. They remind me a little bit of Leroy Clarke's intricate pen drawings. I recall on a visit to the National Museum not too long ago being wowed by Leroy's drawings again, and also marvelling at how well the paper had held up, with no mottling or discolouration. This poster showing Leroy's style of drawing is on the website of Bloomsbury Auctions. It may have browned over time since a poster wouldn't be printed on archival paper. Poster for Leroy Clarke's 1972 exhibition in New York. "82. Tom FEELINGS (1933 - 2003). Collection of personal sketchbooks, early comic book designs, drawings and paintings. Includes: 17 sketchbooks both partially and fully completed, comic book designs, family portraits including a picture made at 6 years old and a painting of the artist’s aunt and drawing of his mother, other early drawings, studies and sketches. Sale NY040, 9th December 2009"
-- which could easily start yet another digression but i thought that was enough for one day. However I did look up Tom Feelings briefly. He was a famous American illustrator who created some powerful images of the slave trade which have left me feeling sobered and sad at man's sickening inhumanity to man. Nobody can buy these projects. Nobody can own these projects. Nobody can charge tickets for these projects. Even we do not own these projects. And later, about The Gates, "It touches people. And it makes people happy." Paul Henry (1876 -- 1958) was an Irish painter who specialized in paintings of the west of Ireland and who was popular during his lifetime. We had one of his paintings at home and I used to love looking at it. 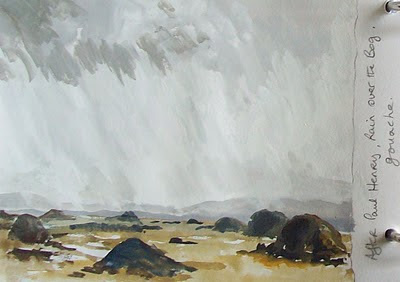 I still love his work, the way he saw and painted the greys which are so characteristic of Ireland's rainy landscapes, his "pale view of hills". To me he is a painter who had something to say. He studied art in Belfast and Paris and is described as a Post-Impressionist on the Encyclopedia of Irish and world Art. I made this little gouache copy of Rain on the Bog and while doing it marvelled at how economically he achieved his effects. Then again he painted landscapes like this over and over during his working life and must have known them off by heart in the end. After Paul Henry, Rain on the Bog (a fair copy though I say so myself). The original of Rain on the Bog is an oil on canvas, 35.5 x 40.5 cm or 12 x 16" approx.